Are Artificial Sweeteners Really That Bad for Me? While these experts express some differences of opinion, they are all contributing thoughtful, well-informed perspectives on a topic that is challenging. For what it's worth, my own view comes down to three key considerations. First, a diet of mostly wholesome foods, and water as the go-to choice for thirst, leaves little, if any, place for artificial sweeteners—so there are none in my diet. Second, I am concerned that such sweeteners tend to propagate a sweet tooth, and thus conspire against the opportunity to rehabilitate your taste buds and love foods (and drink) that love you back. And third, while most of us get way too much added sugar in our diets, a diet of wholesome foods in sensible combinations leaves a small space for a bit of added sugar that contributes pleasure, minus the harm. The artificial sweetener question triggers a troubling set of mixed feeling for me on three levels—medically, scientifically, and metaphorically. Medically, the data are mixed and uncertain. It is a very different situation from cases like trans fats or cigarettes, where toxic medical effects have become clear. As a scientist, the artificial sweetener question is uncertain as the issue highlights weaknesses and limitations in the research tools we have to answer simple questions like whether artificial sweeteners are harmful. We might have to wait 20 years to get clarity on this subject, but in the future, we will gradually gain a much fuller understanding. Metaphorically, artificial sweeteners are an example of the “middle-ground compromise” that simultaneously provide a practical solution while potentially degrading our health in subtle ways. For example, when I use stevia in my coffee it has a bad aftertaste, when I use sugar it’s definitely unhealthy, and when I use artificial sweeteners I’m embracing the middle ground filled with uncertainty and compromise. So when we face the “artificial sweetener question” we are forced to ask much deeper questions. How do we live our best lives as individuals and as a society faced in an imperfect world filled with challenges and opportunities? There are no easy answers, but I’m grateful that our world is filled with many types of sweetness and we have the freedom to choose among the options. Headlines about low-calorie sweeteners and foods sweetened with them have historically contained more myths than truths. These tactics scare people and may preclude their finding a reasonable place for low-calorie sweeteners in their attempt to achieve a healthy eating pattern. When searching to fill a sweet taste, it is just as important to consider the sound research conducted by quality scientists whose findings show no harm or added risk from the limited use of low-calorie sweeteners. The research with negative findings has often included animals and people with compromised conditions and that detail is not in the headlines. In fact, there is a potential benefit over time of substituting sugar-sweetened beverages with artificially sweetened varieties. Replacing a diet soda for a regular one or sweetening coffee with a sugar substitute rather than 3 packets of raw sugar or 3 teaspoons of honey yields a far greater benefit than the risk and reality of increased weight gain. That being said, the availability of low-calorie sweeteners should not mean choosing diet soda over water or drinking beverages with sugar-substitutes rather than low-fat milk and 100 percent fruit juice. But we should offer people choices in keeping with definitive research, thereby helping them to limit their total days’ calories while satisfying their sweet tooth. Let’s meet people where they are and guide them to temper that sweet tooth rather than intimidate and confuse them with half-truths. The importance of avoiding all added sugars in children less than 2 years of age and limiting the intake to 6 teaspoons or less in older children has been recently highlighted by an American Heart Association Scientific Statement. The role of added sugars in contributing to an increased risk in children of developing obesity, cardiovascular disease, hypertension, obesity-related cancers, and dental caries was emphasized. 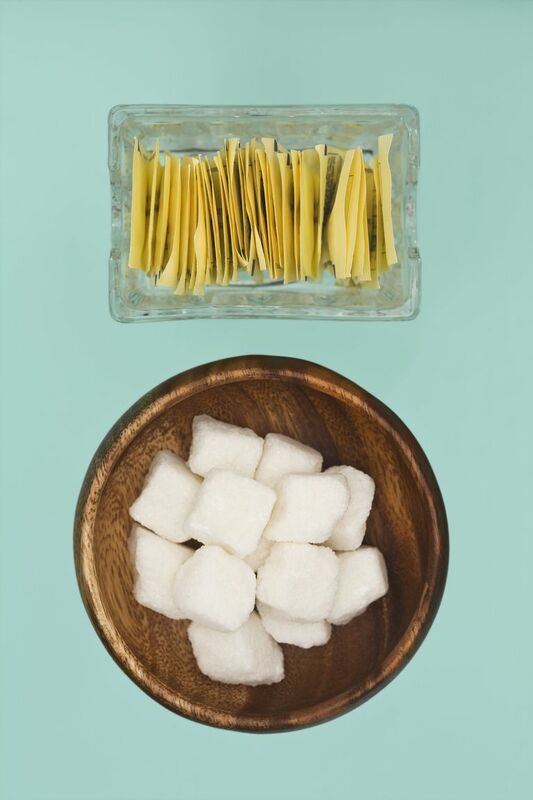 Does substituting artificial sweeteners solve the problem and lower the risk? While we do not know all answers, a Canadian study relating the intake of artificial sweaters in over 3,000 pregnant mothers and subsequent infant obesity is concerning. While this report is an association and does not prove causation, it may indicate an epigenetic risk that is one more reason to avoid artificial sweeteners. I personally avoid all artificial sweeteners. The best places to enjoy a sweet splurge are found in whole fruits, a small square of dark chocolate, and a taste of wine. In theory, the best lifestyle approach would be to have neither added sugars nor calorie-free (usually artificial) sweeteners. But patients expect from doctors the best recommendations based on the best evidence: controlled trials. With a plethora of controlled evidence—well summarized in a meta-analysis published in the International Journal of Obesity, the overwhelming weight (no pun) of evidence is that no-calorie sweeteners—when used in the place of sugar—reduce calorie intake and body weight, period. It's also notable that the most successful weight loss maintainers, as represented by the National Weight Control Registry, leverage the use of no-calorie sweeteners regularly. Concerns about cancer as it relates to common sweeteners, for instance, sucralose and aspartame, seem to be based on very weak and low-quality evidence, as reflected by the perspective of the American Cancer Society in the link provided. The weak argument regarding cancer and artificial sweeteners is also notable in light of the fact that no-calorie sweeteners, when used properly, help reduce the risk of obesity and insulin resistance, significant cancer risk factors. The most significant risk as it relates to no-calorie sweeteners is when people subjectivity exaggerate their benefits and utilize them as an "excuse" to overeat other foods—a form of "health halo" effect. Ultimately, I counsel moderation in use (which is how I personally utilize them). But no-calorie sweeteners have a legitimate role and benefit that significantly outweigh any risks that we know of at this time. Practical use should not be discouraged.